Drope fade haircuts are conquering the men’s fashion world. There are so many of them out there, that you can lose count. The popularity of fades like drop fade haircuts are growing and the new variations are coming to light. Initially, there were just two types of fades: skin and shadow. A skin fade implied some completely shaved area as a starting point of a haircut. The shadow fade starts with some hair on the sides and then grows into a longer fade. So which one is the drop fade haircut? A drop fade is one of the many variations of the skin fade. In fact, the skin part is what gives it its name. The main feature of a drop fade is that the hairstyle ‘drops’ behind the ear, creating a nice and neat arc which is appealing to many men. Drop fade haircuts come in all shapes and size. They vary in the layer and the top part length. The drop fade on the sides doesn’t limit you to a certain type of hairstyle. The longer you grow the hair on top, the more options you have to work with. Drop fades can be high, medium, and low. It’s possible to create such a haircut for men with all hair types. It looks great on thin and brittle hair as well as on thick and curly locks. The main advantage of the drop fade haircut is the low maintenance. Besides keeping the hair on the sides short, the back is also trimmed. Depending on how low you decide to go with a drop fade haircut, your barber appointment frequency will decrease. When you go to the barber shop, you might face a stylist that has a very vague understanding of what a drop fade is. You’ll need to explain that you need the hair behind your ears to drop down in an arc. In order to make sure you get what you are looking for, we recommend you to show your stylist one of the below 7 drop fade styles before getting into the chair. This is a classic example of a low drop fade undercut for men with thin and straight hair. The skin part of a fade starts right above the ear and drops right behind it to create a neat arc. The next fade layer is about half an inch long. The top part of this fade can be as long as you wish, but we prefer it to be long enough to create a stylish comb over as you can see in the photo. This is a great medium drop fade haircut for men who are looking for something hassle-free on the sides but are ready to spend a few minutes a day on the top part. The skin layer of this drop fade is about 3 inches wide while the top part is about 3-4 inches long. The long hair on top needs some maintenance on a daily basis and makes this fade more fashionable. Drop fade haircut is often used to be a part of a fohawk. The farther the hair drops behind the ear, the more mohawk-like style is created. 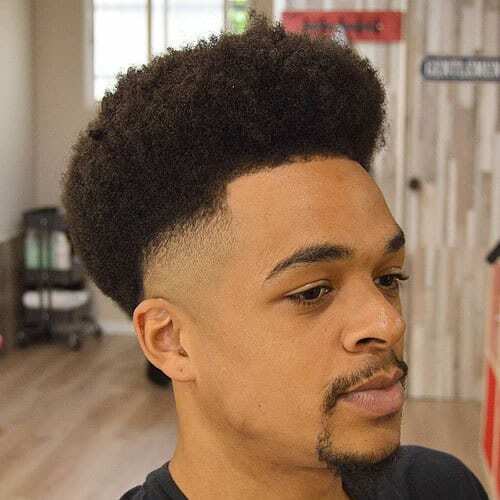 Here you can see a medium fade hairstyle coupled with long and curly hair on top that creates a great mohawk without exposing too much skin. This is a great choice for men with thick and curly locks. Ocean waves are a perfect way to style the top part of your drop fade. In order for the ocean waves to make the best impression, you need to use a high drop fade. The skin should be exposed as much as possible to create a contrast with the top ocean waves. The only downside of this style is that not everyone can create these waves on their own since they require special styling tools. This is another classic approach to a drop fade. It’s a good choice for men with thick and straight hair. The layers on top slowly turn into the faded layers on the sides. The fade drops behind the ears and goes to the back. This is a high fade which is very close to an undercut. It’s a great solution for guys who hate it when the hair gets into their faces. The fans of high hair and shaped-up drop fades will appreciate this drop fade haircut. It’s created to take care of the hair on the sides and the bottom while keeping the top high and neat. Usually, such high hair looks great with all fade levels, including high and low. We believe that the medium option is the most attractive, especially for black men with unruly hair. A high drop fade is exactly what you need to feel free and forget about heavy-duty maintenance. This drop fade haircut takes this approach one step further by shaving the back. The more hair you take off, the more time you’ll have until the next barbershop appointment. Don’t hesitate to ask the stylist for the shaved back. The drop fade haircut looks perfect with it. When it comes to fade haircuts, you often can’t go wrong. If you are tired of the classics, you’ll be glad to know that drop fade hairstyles are offering you a brand new world of fashionable images. By allowing the fade to drop behind your ears, you are making a regular hairstyle neater and more impressive.